As we recently reported, a big pile of old smelter waste in the middle of Butte is one step closer to being removed. Edward O'Brien: President-elect Donald Trump has nominated Scott Pruitt to head the Environmental Protection Agency. If Pruitt's approved, the Standard's David McCumber say that could have implications on the overall Butte Superfund cleanup. DM: Scott Pruitt is best known for suing the EPA. He's got, I think currently seven lawsuits pending against the agency. So without crying before we're hurt, I think a lot of people in Butte are very concerned that the EPA is going to be even less aggressive in terms of enforcing a good cleanup here in Butte. Frankly, there's a lot of feeling that EPA hasn't done nearly enough under the Obama administration here in Butte. So some people might say how much worse could it get. Well, I guess we're gonna find out. The Superfund negotiations and cleanup already lasted nearly 15 years here, and there's a lot more to do. And so what EPA's role in that going forward is suddenly very unclear. And that means what the state's continued role is may have to change. Obviously Governor Bullock decided to take on the Parrot cleanup because the EPA wasn't going there. Now suddenly the EPA decides not to take responsibility or not to enforce a cleanup of the other waste that remains the the Silver Bow Creek watershed there. Maybe the state will have to take on more of a role, and where does that money come from? EO: And it's already costing the state of Montana some $18 million plus right? DM: That's just for the Parrot [cleanup]. There's some discomfort with that because that's money that is supposed to do restoration. In other words. After waste has been removed and a property has been "remediated" as the official jargon goes, then restoration money is supposed to come and make it all good again. Using restoration money to dig up polluted ground is not restoration, it's remediation; and so there's quite a bit of distress that that's where this money's coming from. There's thinking that within the overall negotiations with EPA and ARCO the state will probably try to get this money paid back out of remediation funds. Already there's disagreement and some discomfort about where money's coming from for the Parrot. So if there's another 50 or 60 million bucks needed to clean up the rest of Silver Bow Creek, for instance, where does that money come from and how soon can it get done? EO: And when it comes to the Parrot, despite all the progress that was seemingly made just last week there's still one fairly major detail that stands in the way, and that comes in the form of the county shops, right? DM: Well, that's right, and there's obviously both politics and real estate involved in that so, there's a lot of things that can go wrong. The incoming chief executive Dave Palmer has a bit of a different idea about where he'd like to see the shops relocated than current county staff does. So we'll have to see how that plays out. Clearly this decision's going to have to be made soon enough to get those shops moved by the time they need to start excavation and they'd like to do that this coming season. And I think there's a lot more negotiating that still has to go on. EO: David, 2017 is shaping u p to be as interesting a year for Butte as 2016 was huh? DM: That's the way it looks, yes Ed. 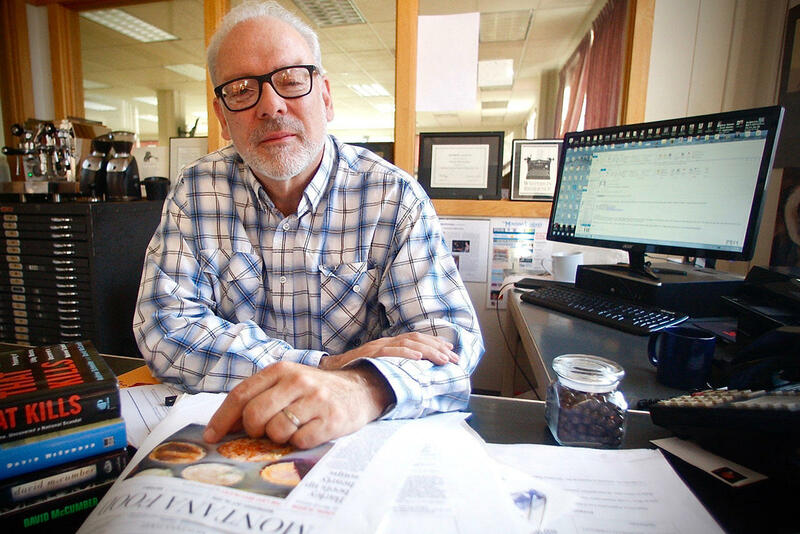 EO: I've been speaking with David McCumber, editor of the Montana Standard. David thank you so much for your time today. Very merry Christmas, happy holidays to you and your staff. DM: And to you Ed, and thanks again for having me. David McCumber is the editor of the Montana Standard. Progress is being reported this week on a long-delayed effort to remove a 50-foot-deep pile of smelter waste in the middle of Butte. Plans to remove a 50-foot-deep pile of smelter waste in the middle of Butte just hit another roadblock. As the Montana Standard reports, it’s the latest in a series of setbacks for plans to relocate the Parrot tailings. Editor David McCumber of the Montana Standard joins us with the latest news. Some Silver Bow County shop buildings have to move to make way for a major environmental cleanup in Butte. Moving the buildings is proving difficult for a number of reasons. The situation is raising concerns about government transparency, the environment and some good old-fashioned election year politics. The Montana Standard has followed the story from the beginning. Editor David McCumber now joins us with the latest. Significant changes seem to be coming in the ongoing Butte Superfund cleanup. When 10,000 snow geese stopped to rest in Butte, in late November, the birds didn’t know they were landing in a toxic pit filled with acidic wastewater. Hawk calls, intended to to scare away other birds, blare from speakers surrounding the pit.